And no, it's not smoking. That's little ball of light is a reflection of the sun on the water. 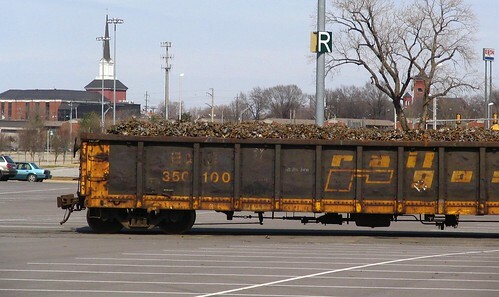 Now that it appears as if the strife between the NFL players and owners has been resolved, they're going to have to clear out all the train cars out of the Tennessee Titans parking lot. OK, so the trains aren't there all the time. However, next door to the Titans lot is one of those companies where you can sell scrap metal to. I guess they put that metal on trains and ship it somewhere where it can be melted down and reused. Eat in a jail cell! 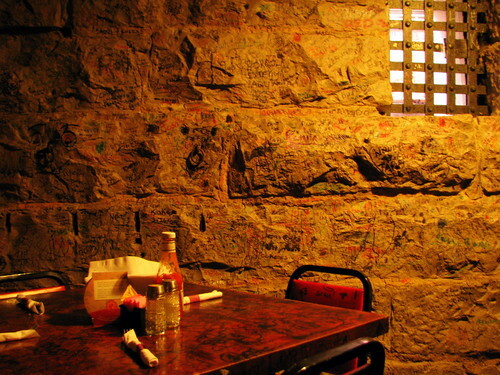 At Cahoots Restaurant in Fayetteville, TN, the owners bought Lincoln County's 18th century jail in the late 80's. This has the premise of being one of the area's best kept secrets. I suspect if the food was really good, it would be a top ten destination. I don't claim to be a food critic, but I don't remember the food being either good or bad. I know a couple of people that live in Fayetteville and they both ate their once, also not finding the food memorable. I drove up when the motel's owner was out mowing the yard. I waited until he was looking the other direction before I got out my camera to take a picture of the sign. 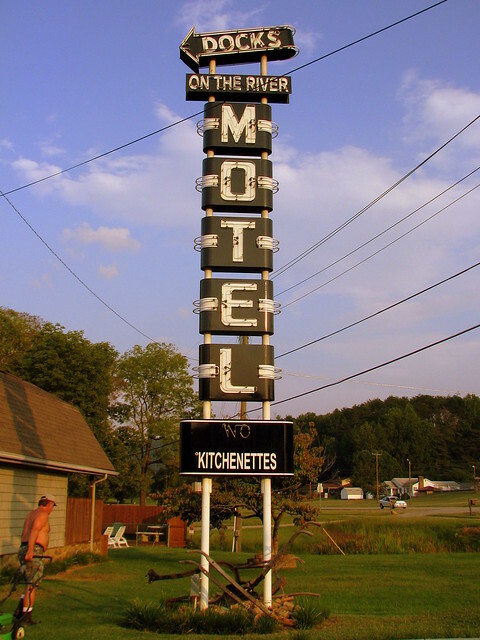 I didn't want him to think I was weird for taking a photo of his motel sign without being an overnight guest. The motel is along the Lamar Alexander Pkwy and the "Little River" on one of the ways to get into the Smoky Mountain National Park without going through Gatlinburg. The Arcade in downtown Nashville, Tennessee, is a covered shopping arcade built in 1902 and modeled after an arcade in Italy. 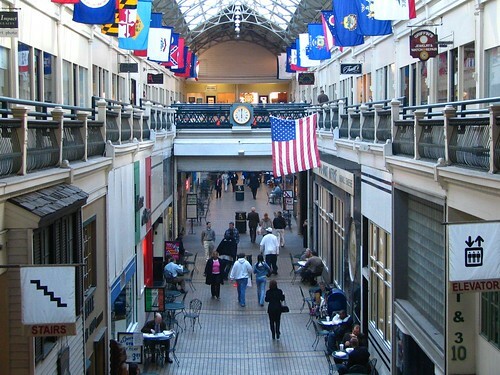 Developed by David C. Buntin and designed by the Edgefield and Nashville Manufacturing Company, the Arcade opened as Nashville's first shopping center, replacing the former Overton Alley. Located between Fourth and Fifth avenues, the entrances consist of identical Palladian facades. The most famous tenant is probably The Peanut Shop. I Have now uploaded the 6th collection of Historical Markers. Nashville, and the counties of Montgomery, Rutherford and Williamson each had enough historical markers to make their own gallery. New galleries are going to have a grouping of nearby counties, like the last grouping of Giles, Lawrence and Maury. The new Extended Gallery online today is for the counties of Coffee, Franklin, Grundy and Marion. If Historic Markers interest you, check it out! Whenever possible, I also include the location of the marker, in case that's something you'd find useful. Occasionally, I'll find more markers in places I've already been. I'll upload the galleries when I have new content. For instance, this past week, I added about 10 markers near Pulaski in the Giles County folder. To see all the Historic Marker galleries, look here! And, that is an outhouse in the background. I feel like I've seen a picture of this somewhere before, but I can't remember where I've seen it. 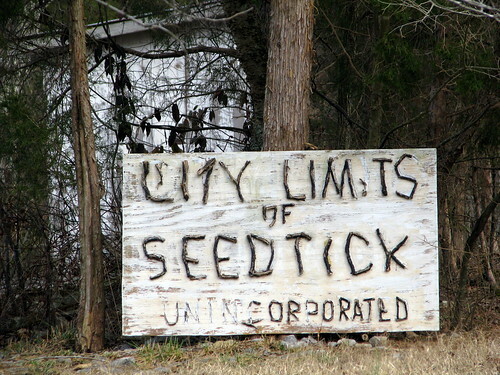 It's in a very remote part of Rutherford County, along a road that used to go into Wilson County, but is now a dead end with the creation of Percy Priest Lake a several decades ago. This is the famous sign at Rock City's Lover's Leap. 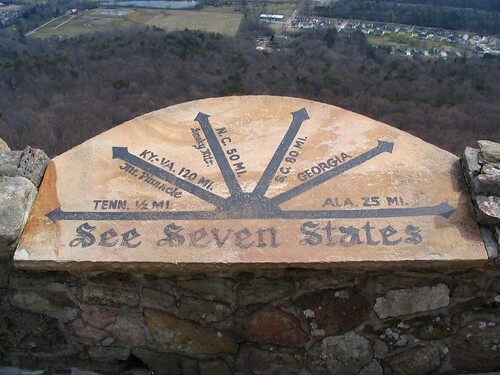 Whether or not you can actually see seven states is debatable, but millions have tried. At this spot, you are in Georgia, Alabama is behind you, and the St. Elmo area of Chattanooga, TN is almost a stones throw away. Nearby mountains from both Carolinas are easy to see, but can you really see across the entire state of Tennessee to see a mountin on the Kentucky / Virginia border? 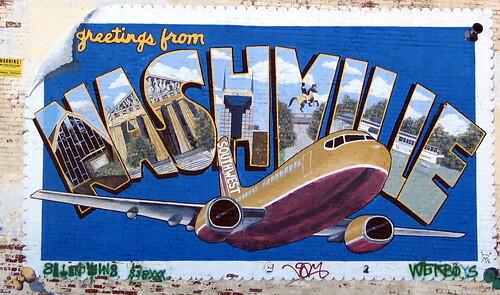 Sadly, I believe this mural is gone, considering how close it was to the new convention center in downtown Nashville. N = the Old Country Music Hall of Fame - now gone. V = Andrew Jackson Statue - At that angle, you'd have the capitol in the background. ILLE = General Jackson showboat, I guess. The thumbtacks are painted on, and the one in the bottom left corner has a painted shadow. "I worked on this commercial. It was painted in March of 97 for the SWA commercial with BR5-49; a local band who played Robert's and helped revitalize downtown. We also filmed out at the old Opryland Theme Park on the roller coaster and at Spence Manor in Webb Pierce's guitar shaped pool. A very fun project." 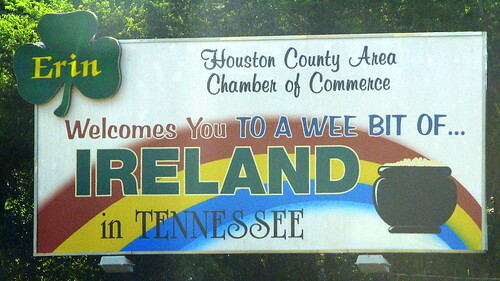 This is the Billboard you see when driving in to Erin on TN Highway 49 from the East. 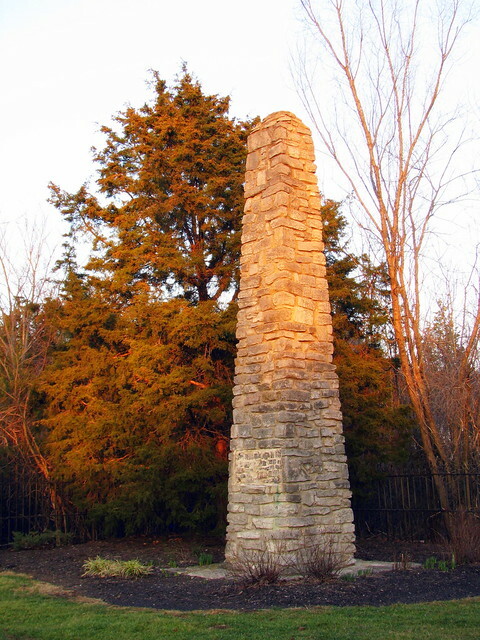 Erin was settled by the Irish laborers who worked on developing the railroad line between Memphis and Knoxville. The Irish named one of their work camps Erin because the clear creek, wooded hills and fog hovering over the West Fork of Wells Creek reminded them of the “Auld Sod” of Ireland. Seen at Kentucky Down Under. 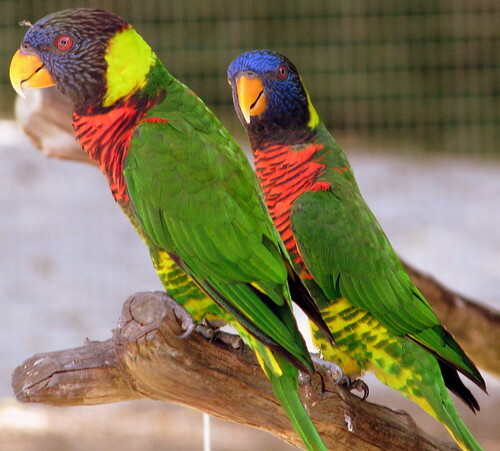 The guide said if you've ever been somewhere else where you get to feed lorikeets (such as the Nashville Zoo), they probably came to research how at KDU, the first place to offer this attraction. Northcutt Cove is a small area just northwest of Altamont down the Cumberland Plateau. The Mormon church building here is the oldest Mormon church building remaining in Tennessee, and one of the oldest in the Southeast. Mormon missionaries first came to the area around 1896. As their numbers grew, a building was soon needed and this chapel was ready in 1909. The first event here was in October of 1909, a debate between the regional Mormon president and a local Church of Christ preacher. 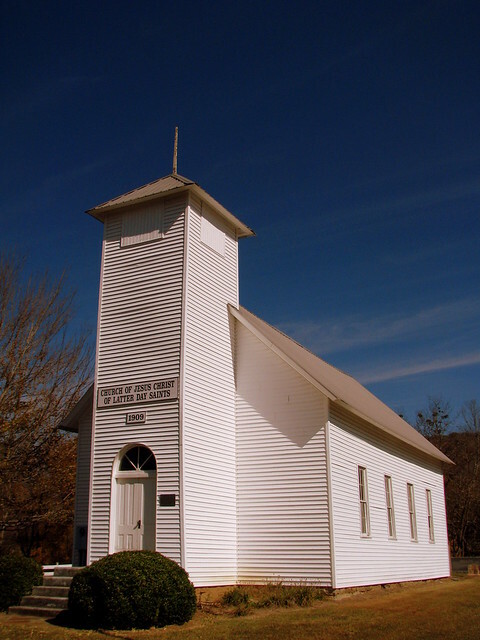 As the congregation grew, and members moved closer to Altamont, This building was built. 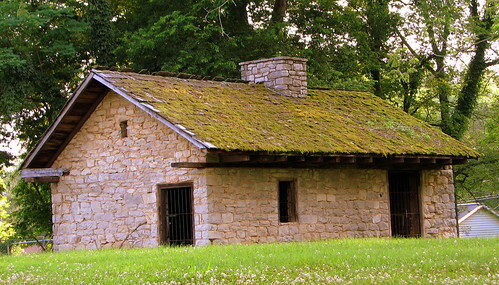 Today, the Northcutt Cove Chapel is on the National Register of Historic Places. There is a cemetery behind the building where local Mormons still get buried. There's a McDonalds along Kingston Pike in Knoxville, TN which was made to look like a retro design (I assume it hasn't remained unchanged for 50 years.) 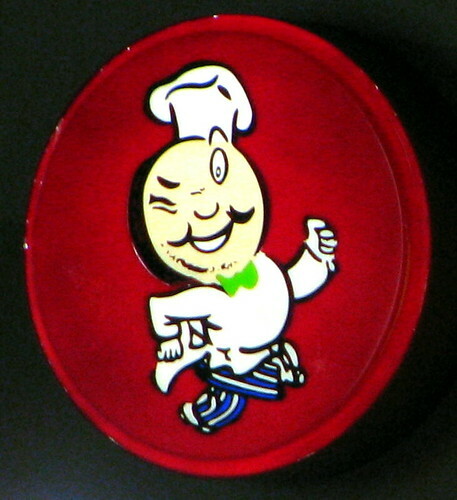 Speedee was eventually replaced by Ronald McDonald in 1967. 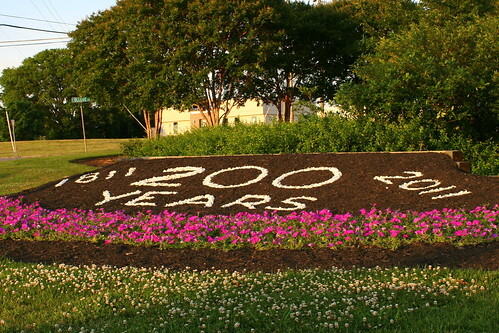 I suppose this year is Murfreesboro, TN 200th anniversary. Or at least, that's what this rock garden says at one of the town's busiest intersections, Where US70S, US41, US231 and TN96 all meet. 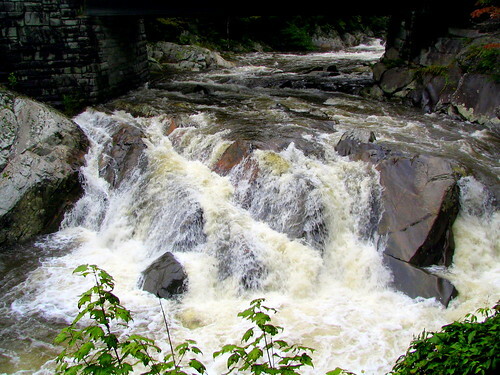 The Sinks is a popular roadside waterfall in the Great Smoky Mountain National Park. There is a small parking lot and entrance along the Little River Road which was completed since I was there. While I suppose this is a waterfall, it is better thought of as large rapids. The Sinks gets its name because of the deep plunge pool underneath the base of the falls. Southern folklore says a logging train once derailed falling into the deep water here - so deep that the train disappeared and was never found. 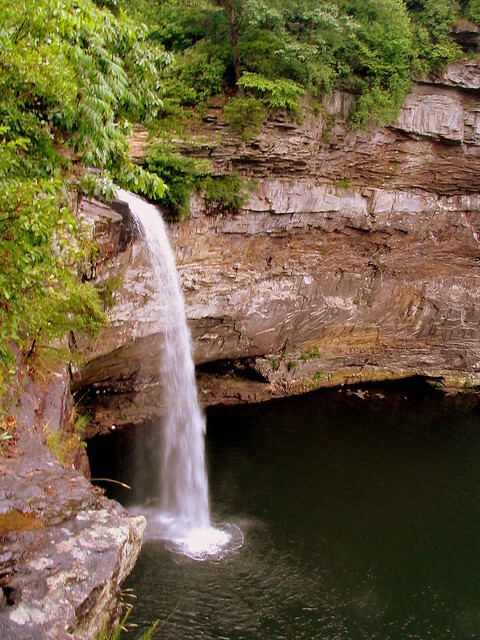 Desoto Falls, which I posted yesterday, and Upper Desoto Falls are named after Spanish explorer Hernando de Soto. De Soto's exploration travelled through the area, likely south of here, but according to legend, some artifacts were found near the falls. Today, this waterfall is part of Desoto State Park, which contains several waterfalls. The Main Desoto Falls is just a few feet downstream from here, and an old 1920's hydroelectric dam is just upstream and is barely seen in the top left corner of this picture. A short paved path leads to the overlook where you can get this view of the falls. 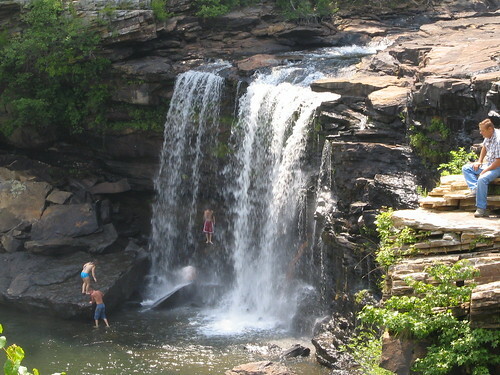 A fork of the Little River plunges 104 feet into the pool below at one of Lookout Mountain's most accesible waterfalls. 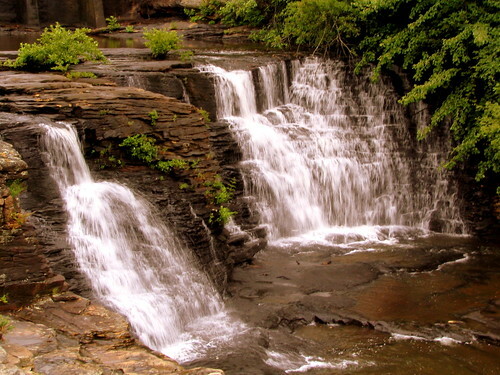 Desoto Falls is named after Spanish explorer Hernando de Soto. De Soto's exploration travelled through the area, likely south of here, but according to legend, some artifacts were found near the falls. According to more folklore, it is suggested that caves in the steep bluff below the falls were part of a fort built by Welsh explorers in 1170, and while most archaeologists and historians find no evidence of this, it's tough to prove something didn't happen that long ago. Today, the waterfall is part of Desoto State Park, which contains several waterfalls. Upper Desoto Falls is just a few feet from here, and an old 1920's hydroelectric dam is just upstream from that. A short paved path leads to the overlook where you can get this view of the falls. On this day, there was also a group on the other side rapelling down the cliffs to get to the bottom. When the fine folks of Giles County, TN wanted to build a new courthouse in Pulaski in 1909, they wanted to make it the finest in the state, which it may be. 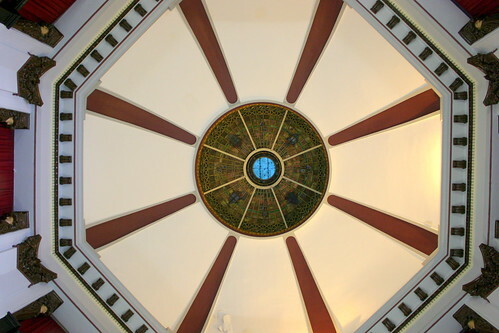 The courthouse has a rotunda and stained glass skylight, whcih you can see from the main floor in an open space while looking up. 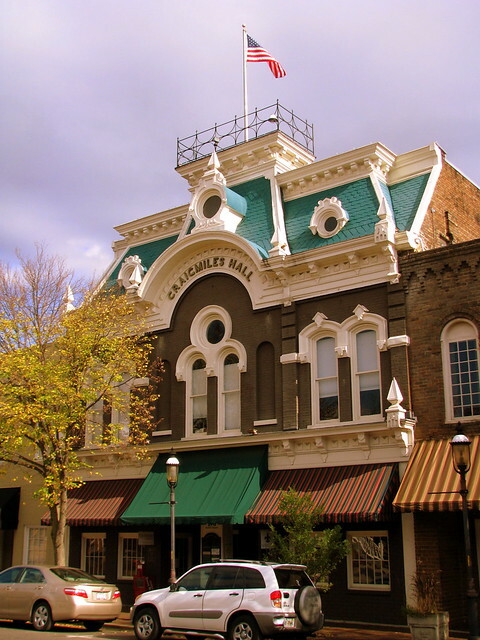 Walter Craigmiles built this ornate Opera House on the Cleveland town square in 1878. 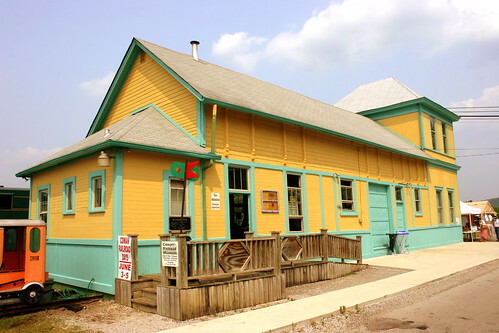 The Second Empire style hall has a brick veneer exterior, the roof is combination built-up and hip design. The windows are wooden double-hung or fixed. Today, the main floor houses a restaurant and the other floors are offices. The building is listed on the National Register of Historic Places. 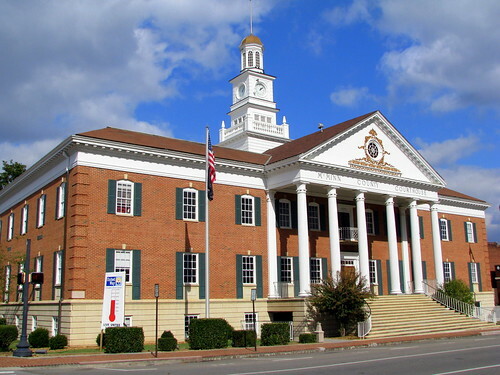 The McMinn County Courthouse was built in 1964 in the center of the Athens, TN town square. It was built to replace the previouse courthouse of 1875, which burned down in the middle of a renovation project. The building is a contemporary classically-inspired deisgn by the Knoxville architects Galloway and Guthrie. The building features a six column projecting pedimented entry portico and a tall clock tower. In 1854, William H Gosling designed this two story building in the Greek Revival ecclesiastical style. The congregation organized in 1810. Today, the building is on the National Register of Historic Places. 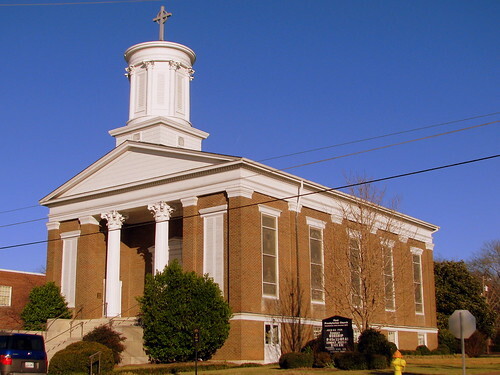 During the civil war, the building was used as a hospital, but worship services continued. Confederate General Braxton Bragg attended a revival here in 1863. While the look of this waterfall might be much less impressive in the summer, when it hasn't rained on Lookout Mountain very much, you wouldn't be able to play in it, like these kids. 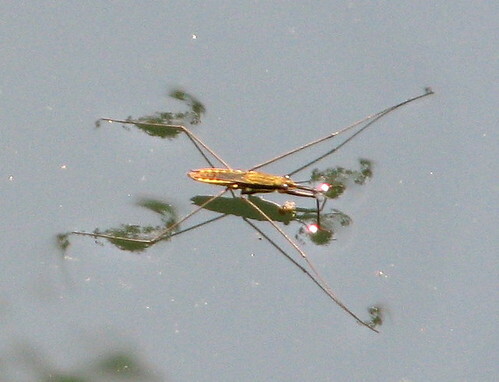 In the winter and spring, heavy rains frequently rushes through even where the guy on the right is perched. 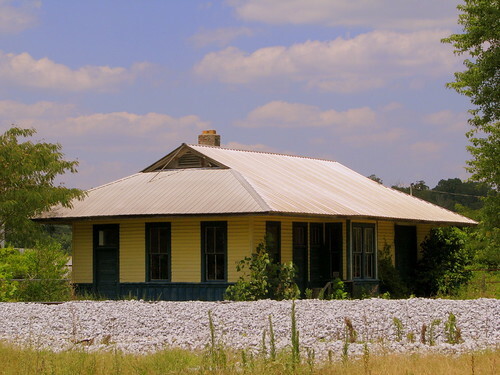 This is in Dekalb County, Alabama, just west of Ft. Payne on highway AL35. This depot was built by NCStL. It may have been moved a couple of times of the years, but today it is not far from where it started. The tracks are in the foreground, so the depot has at least been repositioned 90 degrees. Today the depot is privately owned and used for storage. 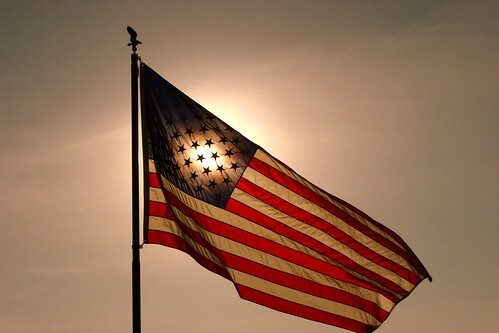 This photo was taken back around Memorial Day for the 3rd annual Healing Field Flags of Remembrance in Murfreesboro. The Seattle Wheel, which comes to the Williamson County Fair every year is probably my favorite ferris wheel to photograph. It's so colorful. The biggest problem is finding somewhere to stand to get the picture. 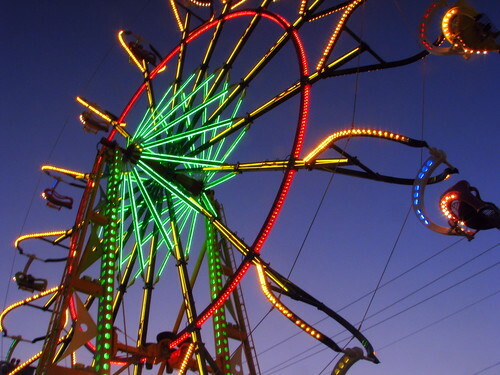 The Williamson County Fair starts in just a little over a month from now. This is has the appearance of a functioning post office (albeit closed on the day I took this photo for a federal holiday). However, it seems to be it the wrong place. On my map, Denver is a small community in Humphreys County about 10 miles west of Waverly. 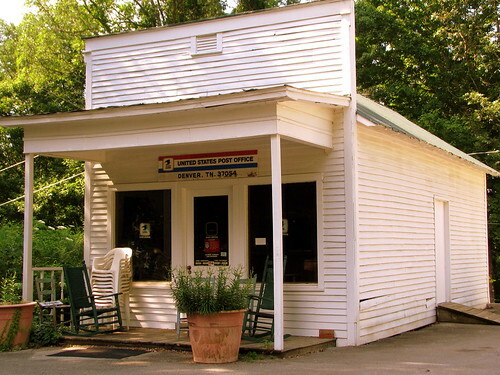 This post office however was in Waverly at the Fort Waverly civil war site. 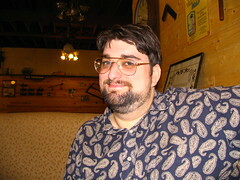 Flickr user Jimmywayne said: The USPS website doesn't have it listed as functioning and that it closed in 1990. Maybe they moved the building to preserve it's history? As of the time this photo was taken, there was no explanation about what we're looking at here. 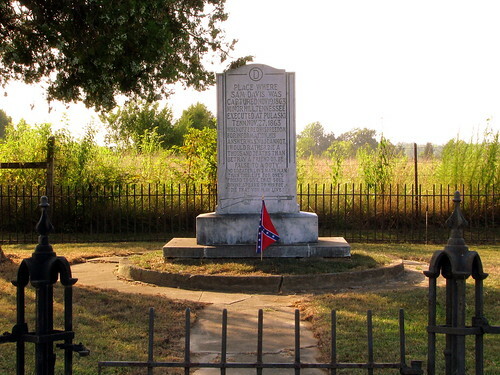 It really is the marker for the geographic center of Tennessee, which is conveniently located just off a major highway. The area now is a fully developed resedential area and this tiny park has no sign, enough parking for about 3 cars, one park bench and an old Iron fence around the small property. This is located in Murfreesboro on old TN96, Old Lascassas Pike and not very far from MTSU. Good news! The plack on the monument has been replaced. I sent an email to the Daily News Journal and they got right on it. Of course there is no way of knowing for sure if my email had anything to do with it, but I choose to believe it did. Anyway there is a picture of the repaired monument in my photostream. I bought stuff at Davis Market as early as 1953, and I have been gone from there for 50 years. OK, I admit that I go back to Murfreesboro for visits. I graduated from MTSU* in 1958. *In those days it was MTSC, but who cares? So, my advice, if you want to see it, do it sooner, rather than later, before someone pries the marker off of it again!